I made today's card in memory of my mother. Her birthday is this week and I miss her terribly. I love you mom. Happy Birthday! 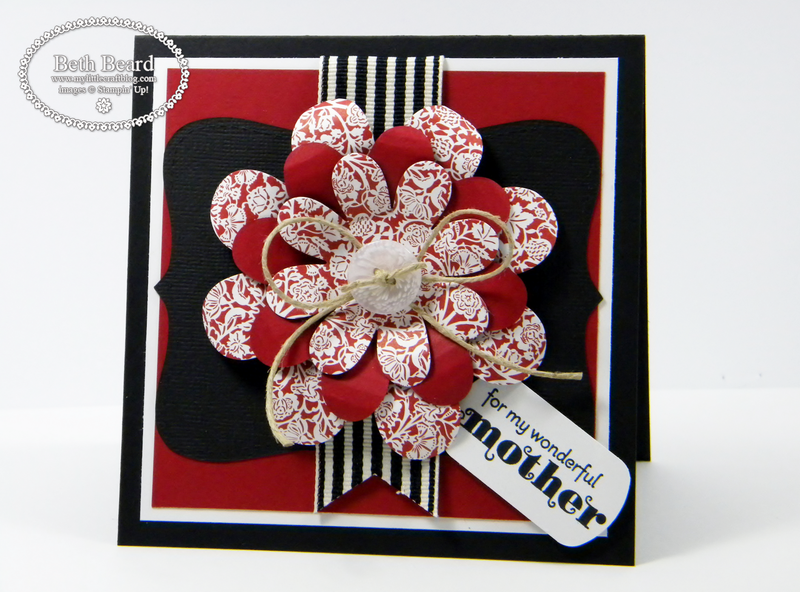 The card measures 5-1/4" x 5-1/4" and the flower was made using the Bigz XL Flower Folds Die. The die cuts the flower in 4 different sizes and I used the three smallest. I curled the petals around a pencil to give it dimension. The paper is Twitterpated from the Occasions Mini catalog and is available for purchase until April 30th. 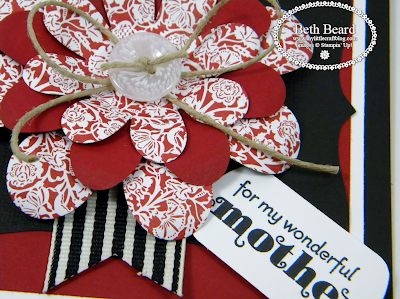 The pattern I chose is busy, so I broke it up using Riding hood Red card stock for the center section of the flower. What a wonderful way to honor your mom. Very pretty card! I'm sure your mom would have loved this card! It is just beautiful. This card is very richly elegant--very beautiful tribute to your mom. A delightful tribute to a lady who I am sure is as equally delightful Beth. I lost mu Mum at age 23 (she was 1 week past her 46th b'day) and there is not a day goes by that she is not thought of. I am sure the smile fm heaven is warming the space around you.